I'm going to be renting some training DVDs from SmartFlix (formerly Technical Video Rental), since they have titles not carried by Netflix or Blockbuster due the high cost of each disc. According to a recent story on TownOnline, SmartFlix carries 3,200 specialty titles for the hobbyist and enthusiast. Have you tried SmartFlix? What did you like or dislike about the service? 0.94 % of dvds are reported defective upon arrival, and less than half of these actually verify as defective (there are false reports for a variety of reasons). The actual defective rate is approximately 0.4%. Because of our heavy duty mailing envelopes, almost no dvds are damaged in transit, so one does not have to double this number. Our 0.4% rate stacks up well next to Netflix's 2.86% rate, but it's a basic business trade off: because Netflix buys consumer movies quite cheaply, they can afford to take the ~ 3% hit, whereas that number would hurt us a lot more, at our higher price point, so we invest in heavier mailers (which, in turn, boosts postage a bit). Netflix founder Reed Hastings will be on 60 Minutes this Sunday. Reuters: Netflix's Red Envelope Entertainment and IFC Entertainment have obtained the North American rights to the Ralph Nader documentary An Unreasonable Man, which will be released on January 31st in theaters and through video-on-demand. The Wikipedia has page about Ralph Nader, in case you're interested in learning more about him. Early in November I returned two movies at the 7th Street Post Office in Oakland, CA. This is the (mothership) main post office sorting facility for all of the East Bay. Both movies never showed up at Netflix and they were both reported as missing. But here's the thing: I returned one movie for me and one movie for my friend. Formula: Two movies, each from a separate account + same post office drop box at same time + Both go "missing" at the same time = Theft! I called Netflix yesterday to report the obvious theft and the CSR said they would pass the information on to a "specialist" -- has anyone dealt with a "specialist" and what do they actually do in a case like this? Should I report this to the post office as well? Has anyone had experience with a Netflix "specialist?" 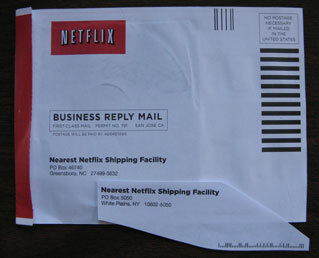 CNN Money wonders "Will movie downloads hurt DVD-by-mail Netflix?" In the December issue of Business 2.0 (print) they asked 25 of the brightest minds "How to Succeed in 2007," and Reed Hastings responded: "With Netflix, the biggest weakness is that it takes a day to get your movie. If we talked about that, we would be ineffective. So what we talk about is no late fees, no due dates, and being aggressive on price. You focus their attention on features that are compelling, like allowing people to keep movies as long as they want. Most people always try to fix the product, which is a good thing. But brilliant marketing is taking the product you have and figuring out the right positioning. BitTorrent announced that they have added 20th Century Fox, G4, Kadokawa, Lionsgate, MTV Networks, Palm Pictures, Paramount and Starz Media as digital download partners, in addition to already signed partners Warner Bros. Home Entertainment, Egami Media, Hart Sharp, Koch Entertainment and The Orchard. BitTorrent expects to launch the digital download service in February, 2007, and pricing is to be determined. They will have download-to-own and video-on-demand options, as well as ad-supported content. Tidbit from the release: "With many millions of users, BitTorrent traffic accounts for as much as 40 percent of all worldwide Internet traffic." This is a great perk if you're into independent films: "Are you a supporter of indie films? Are you interested in getting screeners of films before they come out on DVD? Have you reviewed at least 3 indie films in the past three months? If so, send an email with your name, address and links to 3 recent indie film reviews to erik.martin [at] palmpictures.com. Palm Pictures will send you screener DVDs of films before they are released, and an occasional catalog title, too. There is absolutely NO OBLIGATION to review these films and if you should choose to review them we only want honest no-holds barred reviews. The first DVD that we'll be sending out to our Netflix VIPs will be THE MOTEL, which was just got an Independent Spirit Award nomination for the Best First Feature." Speaking at the Reuters Media Summit yesterday, Blockbuster CEO John Antioco began to flesh out what the company's digital strategy is likely to entail." Conventional wisdom says consumers don't want another set-top box," he says. "I'm not sure I'm in that camp." Please tell me that he didn't just say what I think he said? Too late. He said it. Antioco feels that consumers want one more gadget wired into their home theater systems. He points to MovieBeam as "an interesting model" that the company may be emulating, but doesn't stop to realize why MovieBeam has never gained any kind of traction. Antioco also fired another shot at Netflix CEO Reed Hastings at the conference: "Antioco — who sent a kitchen sink to Netflix’s headquarters after Hastings told analysts last year that Blockbuster had “thrown everything at us but” that particular appliance — warned on Tuesday that Hastings had best abandon forecasts for Netflix to own the online market. In Antioco’s view, the size of the online DVD rental market is not much bigger than 20 million subscribers — the same number of subscribers Netflix says it will have by 2012." It's good to see a full-blown battle between Blockbuster and Netflix, because in the end it's the customer who will win. Thanks to Tom for sending this in. Most of my Netflix movies come from White Plains or a shipping center that is close to my house, but I recently received a movie from North Carolina. It took a couple of days to get here, so I didn't want to wait extra time for it to ship back. There have been a number of "hacks" to change the label, but this was fast and easy. I made a bunch of photocopies of a Netflix mailer with a local return address, and then cut out and taped the label over the distant address. The movie was received by Netflix the next business day. HBO executives have been hashing out the details of what they will offer online, and a spokesman says no formal decision has been made. But programming will almost certainly be offered via a subscription service, much like the mixture of HBO movies and original fare such as The Wire, Deadwood, and Big Love now offered by cable and satellite operators for a monthly fee of $10 to $12 or more. Tidbit from the story: "Those "affiliates" generally pay HBO around $6 a month for each of its nearly 30 million subscribers, according to cable industry analyst Kagan Research."